I can't get enough of mixed prints lately. Leopard with Polka Dots, Florals with Ikat, Camo & Stripes.. what once was considered taboo is now totally in. And even though this isn't the most bold mixing I've ever done, I still love the ease and chicness of the combination. This past weekend was an exciting one but it was Sunday morning that I was actually looking forward to the most. Emily, the gorgeous blogger from Life with Emily hosted a bloggers brunch at my favorite restaurant Coquette Brassiere and I finally had the opportunity to meet some local NC bloggers! In our world, heck in any world, it's beyond important to stay connected with actual face-to-face time! Sometimes it's easy to get behind our twitter feeds and facebook pages that we forget to form real-life, in-the-flesh relationships. I was so happy to meet some lovely ladies who I've been fans of and finally putting a 3-D face to the name.. and.. photos! A BIG thanks again to Em for putting this whole she-bang together! You look amazing and I love this combination of prints. This is one look I definitely must try soon. Thank you for the inspiration, and I am adoring those shoes. I am obsessed with print mixing lately as well! 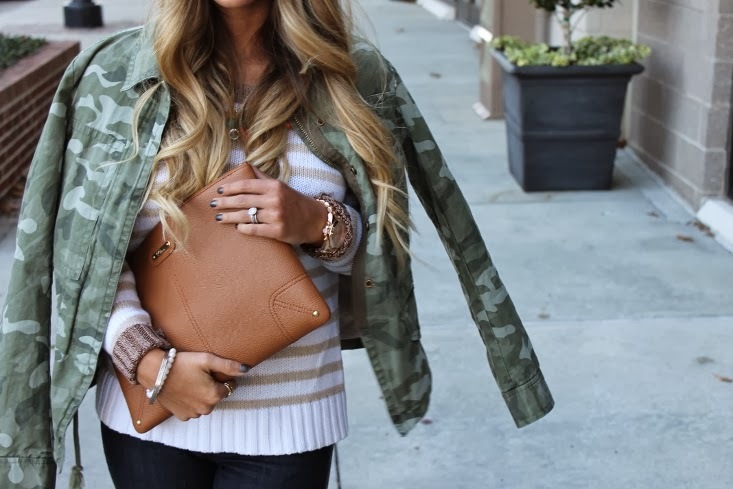 Love the stripes and camo. 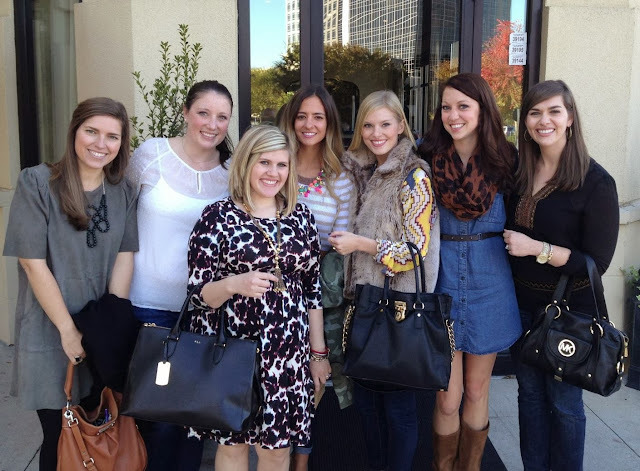 And how fun to meet up with other bloggers! I bet it was a blast! Love it. The necklace and shoes especially! OMG, I need that necklace! Actually I'll just take the whole outfit! Love all of it...from the camo and stripes down to the shoes. And how fun to meet some other bloggers face to face! Looks like a great time, sorry I missed it. Love your shoes and the mixing of stripes and camo! Dropping by from Three-fer Thursday! I'm loving print mixing this fall too! This combo of stripes and camo is really fun. Absolutely gorgeous! And I LOVE your hair!!! How fun to meet up, looks like you guys had a great time!!!! Love that necklace and those shoes! I am loving the print mixing and how you styled the color mix necklace! Thanks for sharing with Three-fer Thursday! Hi again, looking to know the brand of your jeans... would love to hear back from you. Thanks! 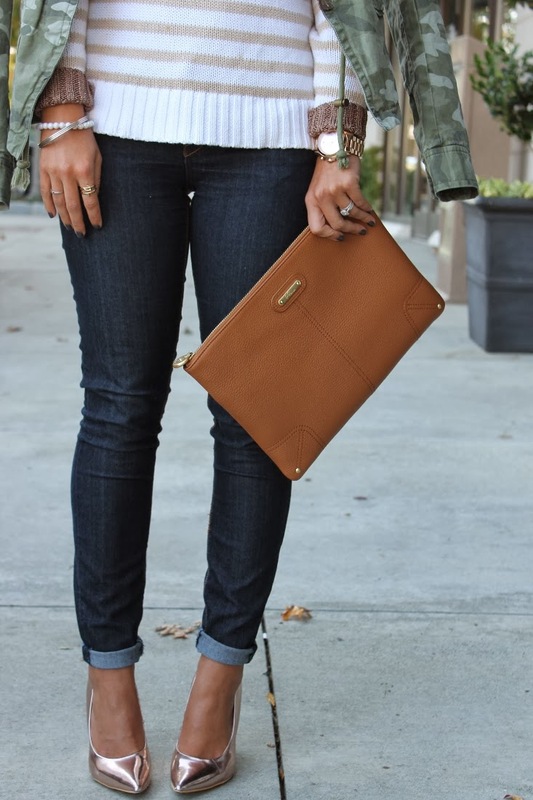 necklace + shoes = yes! I love these prints on you! I LOVE this necklace! any suggestions on where to find a similar multi colored one? ?